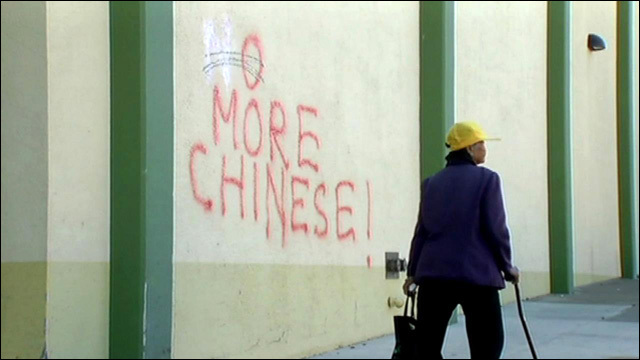 Hey, Racist Vandal. We fixed it for you. 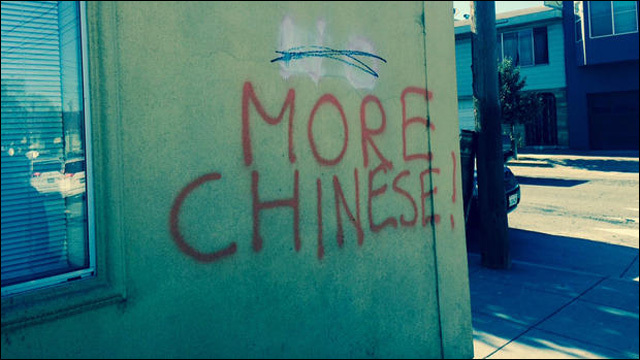 Community members respond to ant-Chinese graffiti in San Francisco's Portola neighborhood. 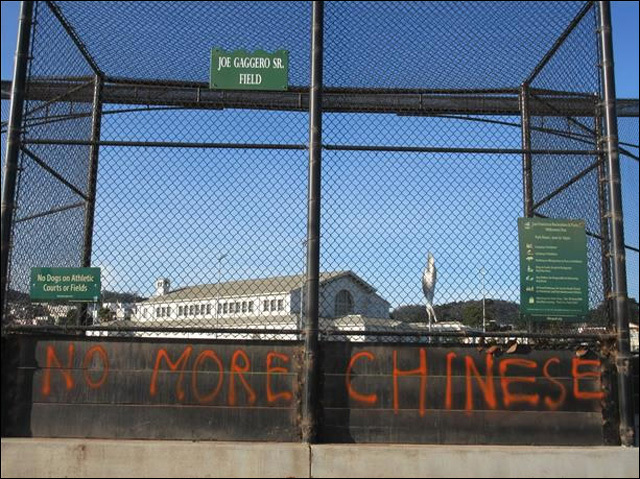 Over the weekend, several instances of anti-Chinese graffiti were recently discovered in San Francisco, mostly in the Portola neighborhood. 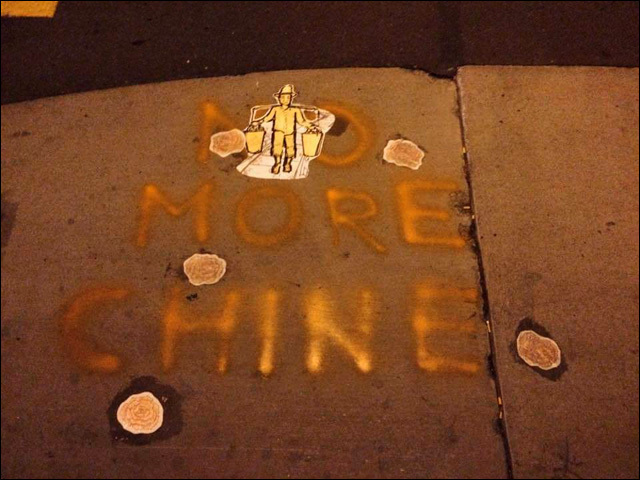 All were done with the same colored spray paint, wording and lettering, by someone declaring the racist message NO MORE CHINESE. 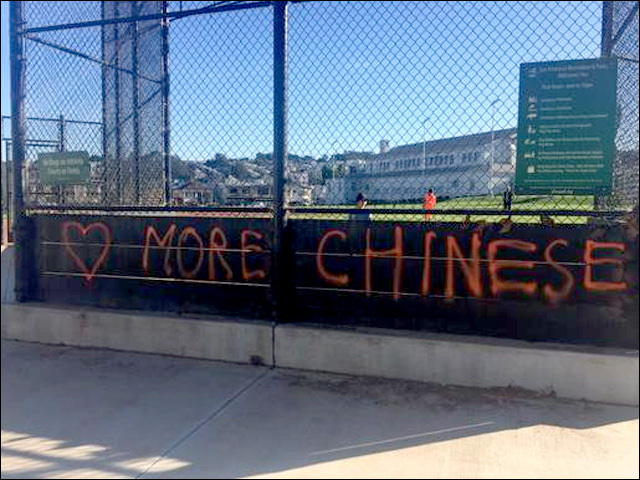 Several news outlets have picked up on the story, and the incidents are being investigated by San Francisco Police as vandalism and a hate crime. 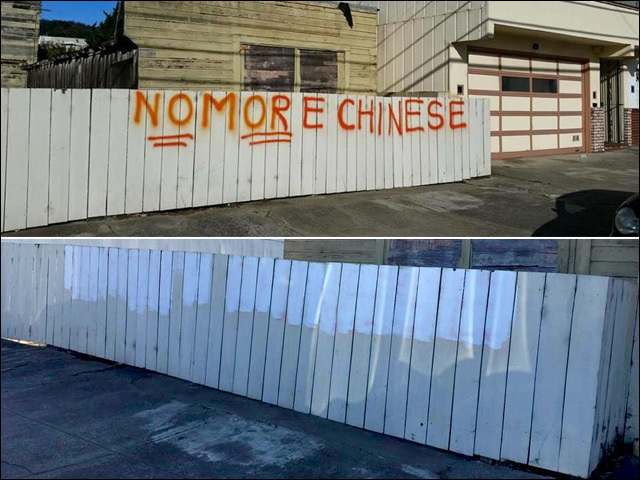 With all the negative attention, the city acted relatively fast to remove the offending graffiti from affected surfaces. 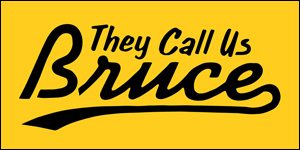 But not before quite a few concerned citizens took photos, spread the word, and even took upon themselves to add a little subversive flavor of their own to the artist's original message of intolerance. 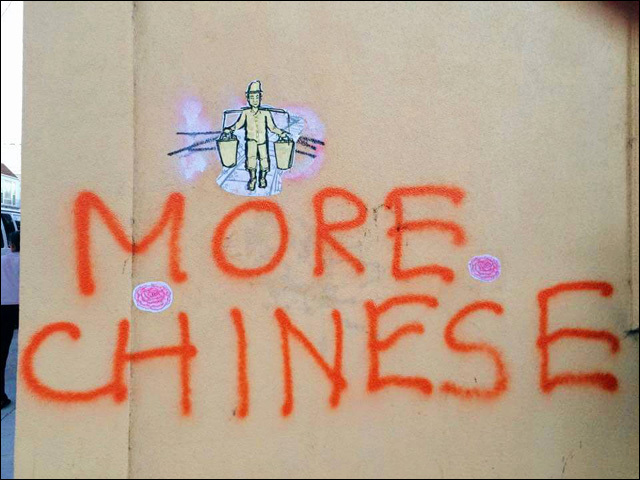 I added my own Photoshop fix -- "KNOW MORE CHINESE" -- to the photo above. Here, at the corner of Somerset Street near Silver Avenue, someone painted over the "NO," followed by the vigorous stroke of a greenish crayon. MORE CHINESE! Take that, vandal. This attempt was far less successful. 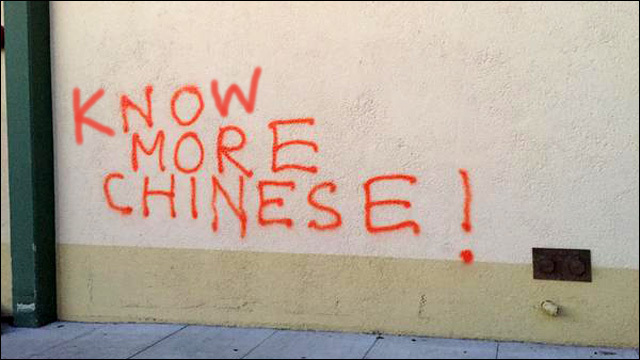 But "O MORE CHINESE!" does have a rejoicing kind of quality to it. ❤ MORE CHINESE. Much better. Nathalie and Dolly got rather creative, and rolled through Portola to add their own artistic touch. 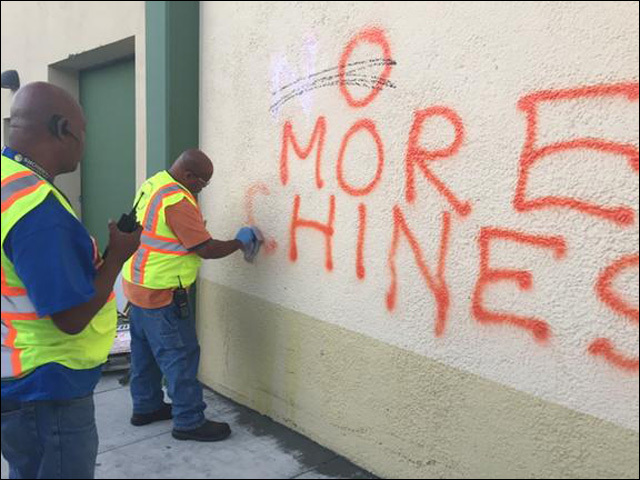 By Monday evening, Public Works had descended on Portola to remove all traces of the graffiti. Now the question remains: who the hell did it? SFPD says officers are looking for video footage from private security cameras in the area, along with any witnesses. Anyone with information about the crimes is asked to contact San Francisco police at (415) 575-4444 or to text TIP411 with the letters "SFPD" at the beginning of the message. Meanwhile, the Portola community is responding to his hate speech by coming together for a Peace & Unity Rally to heal and celebrate the diversity of the neighborhood. It's happening Thursday, September 10 at 6:00pm at Palega Park. 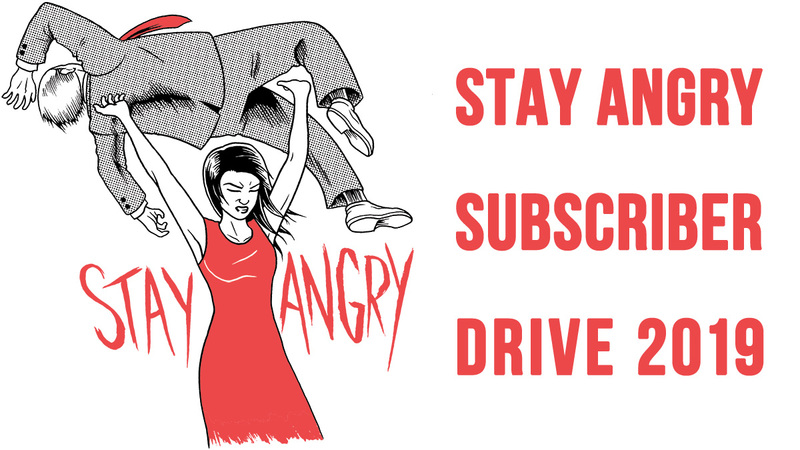 Refer to Facebook for further details.